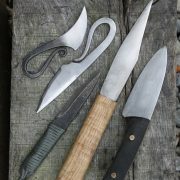 Course summary: Blade smithing / forging of one layer knife blades for beginners. 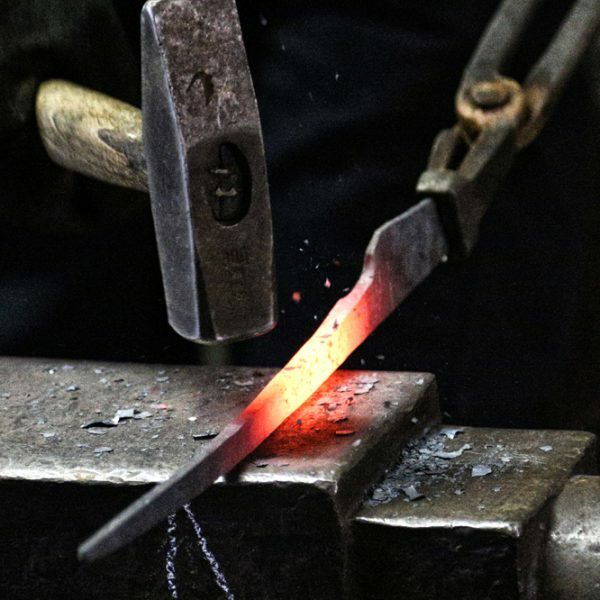 If you would like to make a good knife blade of your own design, spend a day blacksmithing and get an insight into practical heat treatments, this is the course for you. This is a one-day course in practical hands-on blade smithing, specifically for the forging of knife blades for beginners. Arrival is at 9am, where Gunvor the tutor will introduce the forge. The participant’s individual work spaces as well as health & safety is covered. The correct use of the coke hearths involves how to maintain the fire. How to achieve the correct heat in the right place. The minimum and maximum heat ranges and their corresponding colors. To give you some insight into the working day of a full-time blacksmith Gunvor will usually fill you in as to what’s currently on at the forge. If you are interested in full-time education in the craft, you will get a chance to ask the tutor about this. After this introduction the blade smithing project quickly gets on the go. Its time to sketch your desired blade-type onto ‘blacksmiths paper’ (a rusty sheet). You will use this as a reference for the day. Next you will get a piece of carbon steel bar to fit your chosen blade. 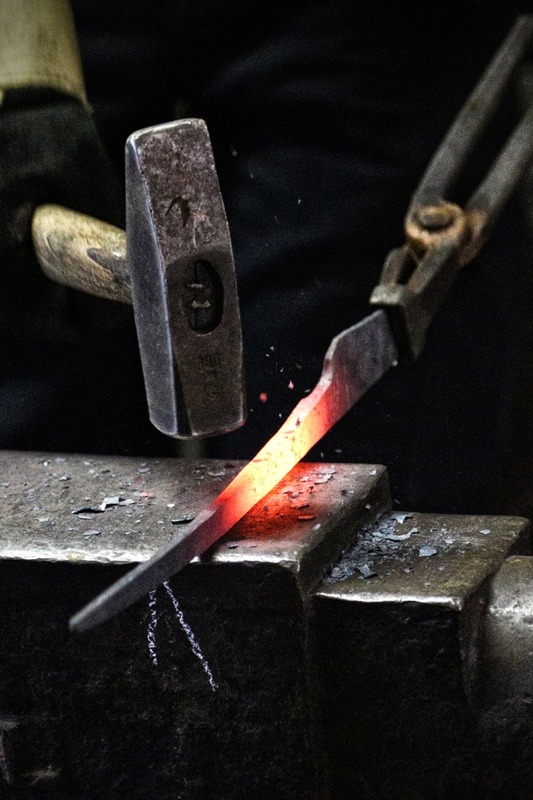 Your own hammer and anvil – and away you go – it’s time to get blade smithing! The hot forging part of the blade will continue to lunch time at 1pm. Certain types of blades will need more time to finish, this could take until 3-4pm. 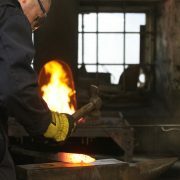 If you would like more time at the anvil – perhaps consider signing up for our blacksmithing taster course instead. 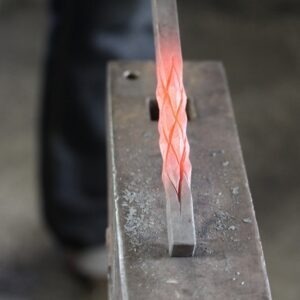 I have always wanted to make a knife in a forge. So decided to try this. Gunvor made this A perfect experience for me. From the coal forge ( yes Gunvor I know it’s not coal but can’t remember the right name haha) to the polishing she took us through step by step. Allowing us to do whatever we wanted with the knife. 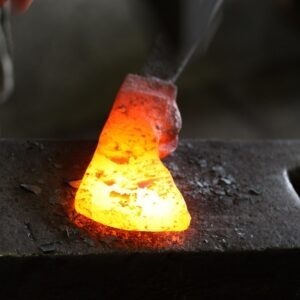 I cannot Express how much I would recommend this class if you have ever thought about getting in front of a forge. Thank you both for an amazing day out!! I must say I had a blast at the blade smithing course, so much so i’m going to try and go again as soon as a space opens up. It was a real hands on day and I loved it. Gunvor was fantastic and it was a pleasure to spend the day with her in the forge. I can’t wait to get back to their forge and try some of their other classes. I would highly RECOMMENDED the blade smithing course to anyone. Thanks Gunvor for a great day. Gunvor – Thanks for such a great day on Saturday last. You were immensely patient, it was interesting to take a flat steel profile and bend it, twist it, shape it and hammer it under heat. I think that all six of us were delighted with the blades that we made. 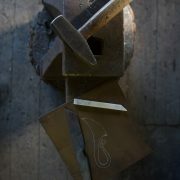 For anyone interested in learning a new skill I highly recommend the bladesmithing course. Amazing day out! I was surprised with how much freedom we were given. The time taken to explain things and get on with it was excellent! Gunvor made excellent use of simple playdo to explain how the metal moved and really gave a good insight into why things work as they do. I WANT TO GO DO IT AGAIN! IT WAS AMAZING! I know this is my second review so I’ll keep it short. 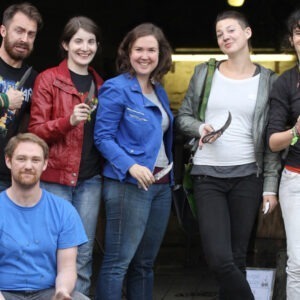 I just took the blade-smithing course for the second time and I must say it was as awesome as it was the first time – it was actually even better! Thanks Gunvor for another great day. The blade smithing was an amazing experience I can not recommended it enough. Gunvor is an excellent teacher. Explained everything in great detail and then let’s you have at it. It really is cool to see the lump of steel you start with turn into an awesome blade by the end. I enjoyed it so much I have signed up again. Hammering away on that glowing steel is addictive. Than you kindly Mark! 😃 Sounds like you’ve been hooked on blacksmithing! Thanks very much Kevin, much appreciated! Hi Gunvor. 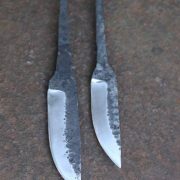 Eoin & Ryan are still buzzing from their bladesmithing experience last Saturday. Thank you for taking them on your course. It was everything & more that they hoped it would be. You have certainly added fuel to the fire in their bellies for forging. We hope to see you again in the not too distant future. P.S. they apologise again for getting lost in the maze & being late back to class! !